It was not your typical Happy Hour on the Sunset Strip. 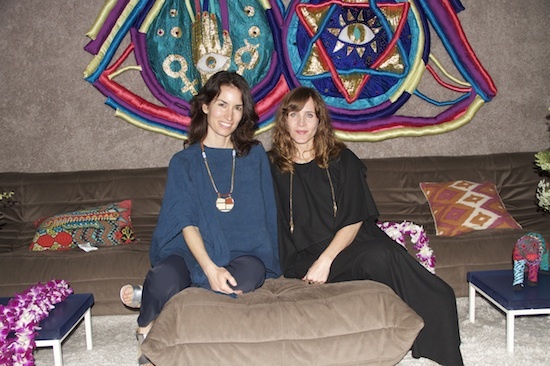 Last Thursday, the Standard Hotel hosted the L.A. premiere of “The Source Family,” a documentary by Jodi Wille and Maria Demopoulos. In honor of the 1970s Hollywood commune portrayed in the film, which is the first feature for both directors, the lobby was swathed in colorful fabrics and bedecked with flowers. Psychedelic music snaked through the speakers while longhaired boys and girls milled about, dressed in their flowing finest. In a glass case behind the counter, two young women lounged and did yoga poses, much to the obvious bemusement of the tourists who stood with rolling suitcases, waiting to check in. Directly across Sunset Boulevard, Wille, Demopoulos and some friends had gathered with former Source Family members in the parking lot of the Cabo Cantina. Forty years earlier this had been The Source Restaurant, founded by Jim Baker, who later took the name Father Yod. This vegetarian hot spot was a favorite of celebrities like Steve McQueen and Goldie Hawn, and for a three-year period it supported the utopian cult’s 140 members and their godlike, silver-maned leader. This parking lot congregation, which began with a reading of the names of members who had passed, was, as Isis put in, “a homecoming.” Electricity Aquarian (all Source Family members legally took “Aquarian” names, but only a fraction still use them) led a ritual called the Star Exercise, a daily Source Family practice meant to channel “universal life energy” into the body. In fitting Source fashion, the procession going back to the Standard included two wide-eyed, wild-haired young men who’d abandoned their margaritas at the Cantina to join the party. Just for the night, the hotel’s 24/7 Restaurant was featuring signature Source dishes. Magus Aquarian, now a successful software entrepreneur, was having the Aware Salad, a mix of carrots, beets, cabbage, sprouts and avocado, plus a cheeseburger and fries. “Don’t tell the Source people!” joked the man who admitted that he had viewed the experience more as a spiritual adventure than a path to salvation. As he tells it in the movie, when taking his very sick young son to the hospital meant defying Father Yod, Magus and his wife Harmony left the Family for good. It didn’t hurt that Hollywood casting agents couldn’t have assembled a more gorgeous bunch, or that “home” was a mansion in the Hills with a pool – all depicted idyllically in the film with home movies and photographs. While it’s unlikely that such an insular community could exist today in the era of iPhones (to say nothing of reality TV), this unique history, explored in the 2007 book “The Source,” written by Isis and Electricity and edited and published by Wille, has made an undeniable impact on the ideology and style of a new generation of Angelenos. The 400-person premiere was held on the Standard’s pool deck, where the artists Miss KK and Alia Penner had created a colorful, cosmic chill-out lounge. The dress code was “clothing optional,” and before the film even began a bevy of naked beauties splashed in the pool. The unmistakable scent of “sacred herb” (another Source Family practice gone above ground) wafted through the air as hotel guests peered over their balconies, no doubt thinking they’d lucked into the best show in town. The evening was a reunion of sorts for many of the 40 Family members who had flown in from Hawaii or traveled from other parts of California. They greeted each other with hugs and delighted squeals, mingling with the crowd of local musicians, filmmakers, artists, designers, stylists and counterculture aficionados. A barefoot photographer wearing a loincloth wove among them, shooting the scene while he wasn’t being photographed himself. Thanks to the incredible trove of archival material dutifully recorded and preserved by Isis Aquarian, the film paints a remarkably detailed portrait of this radical social experiment. It’s a wild ride, one that allows us to experience the allure of handing over one’s earthly possessions and individuality to a larger, all-loving entity, as well as the disillusionment and shame when those ideals collapse. The drama is heightened by an eclectic soundtrack of trippy folk tunes and heavy psych grooves that will be released by Drag City later this month.